Purpose: Initiative 502 legalized marijuana for recreational use under certain conditions. I-502 also created three new license types and requirements for each license type. Requirements were also created for the producing, processing, and retail sales of marijuana. This rule making is the first rule making to implement I-502. This is a new industry in the state of Washington. Rules are needed to clarify the new laws created by I-502 so the public is aware of the qualifications and requirements for marijuana licenses in the state of Washington. Statutory Authority for Adoption: RCW 69.50.325, 69.50.331, 69.50.342, 69.50.345. Adopted under notice filed as WSR 13-18-086 on September 4, 2013. Number of Sections Adopted in Order to Comply with Federal Statute: New 0, Amended 0, Repealed 0; Federal Rules or Standards: New 0, Amended 0, Repealed 0; or Recently Enacted State Statutes: New 49, Amended 0, Repealed 0. Number of Sections Adopted in Order to Clarify, Streamline, or Reform Agency Procedures: New 49, Amended 0, Repealed 0. Date Adopted: October 16, 2013. WAC 314-55-005 What is the purpose of this chapter? The purpose of this chapter is to outline the application process, qualifications and requirements to obtain and maintain a marijuana license and the reporting requirements for a marijuana licensee. Following are definitions for the purpose of this chapter. Other definitions are in RCW 69.50.101. (1) "Applicant" or "marijuana license applicant" means any person or business entity who is considered by the board as a true party of interest in a marijuana license, as outlined in WAC 314-55-035. (2) "Batch" means a quantity of marijuana-infused product containing material from one or more lots of marijuana. (3) "Business name" or "trade name" means the name of a licensed business as used by the licensee on signs and advertising. (4) "Child care center" means an entity that regularly provides child day care and early learning services for a group of children for periods of less than twenty-four hours licensed by the Washington state department of early learning under chapter 170-295 WAC. (5) "Elementary school" means a school for early education that provides the first four to eight years of basic education and recognized by the Washington state superintendent of public instruction. (6) "Financier" means any person or entity, other than a banking institution, that has made or will make an investment in the licensed business. A financier can be a person or entity that provides money as a gift, loans money to the applicant/business and expects to be paid back the amount of the loan with or without interest, or expects any percentage of the profits from the business in exchange for a loan or expertise. (7) "Game arcade" means an entertainment venue featuring primarily video games, simulators, and/or other amusement devices where persons under twenty-one years of age are not restricted. (8) "Library" means an organized collection of resources made accessible to the public for reference or borrowing supported with money derived from taxation. (9) "Licensee" or "marijuana licensee" means any person or entity that holds a marijuana license, or any person or entity who is a true party of interest in a marijuana license, as outlined in WAC 314-55-035. (b) The trim, leaves, or other plant matter from one or more marijuana plants. A single lot of trim, leaves, or other plant matter cannot weigh more than fifteen pounds. (11) "Marijuana strain" means a pure breed or hybrid variety of Cannabis reflecting similar or identical combinations of properties such as appearance, taste, color, smell, cannabinoid profile, and potency. (12) "Member" means a principal or governing person of a given entity, including but not limited to: LLC member/manager, president, vice-president, secretary, treasurer, CEO, director, stockholder, partner, general partner, limited partner. This includes all spouses of all principals or governing persons named in this definition and referenced in WAC 314-55-035. (13) "Pesticide" means, but is not limited to: (a) Any substance or mixture of substances intended to prevent, destroy, control, repel, or mitigate any insect, rodent, snail, slug, fungus, weed, and any other form of plant or animal life or virus, except virus on or in a living person or other animal which is normally considered to be a pest; (b) any substance or mixture of substances intended to be used as a plant regulator, defoliant, or desiccant; and (c) any spray adjuvant. Pesticides include substances commonly referred to as herbicides, fungicides, and insecticides. (14) "Perimeter" means a property line that encloses an area. (15) "Plant canopy" means the square footage dedicated to live plant production, such as maintaining mother plants, propagating plants from seed to plant tissue, clones, vegetative or flowering area. Plant canopy does not include areas such as space used for the storage of fertilizers, pesticides, or other products, quarantine, office space, etc. (16) "Playground" means a public outdoor recreation area for children, usually equipped with swings, slides, and other playground equipment, owned and/or managed by a city, county, state, or federal government. (17) "Public park" means an area of land for the enjoyment of the public, having facilities for rest and/or recreation, such as a baseball diamond or basketball court, owned and/or managed by a city, county, state, federal government, or metropolitan park district. Public park does not include trails. (18) "Public transit center" means a facility located outside of the public right of way that is owned and managed by a transit agency or city, county, state, or federal government for the express purpose of staging people and vehicles where several bus or other transit routes converge. They serve as efficient hubs to allow bus riders from various locations to assemble at a central point to take advantage of express trips or other route to route transfers. (19) "Recreation center or facility" means a supervised center that provides a broad range of activities and events intended primarily for use by persons under twenty-one years of age, owned and/or managed by a charitable nonprofit organization, city, county, state, or federal government. (20) "Residence" means a person's address where he or she physically resides and maintains his or her abode. (21) "Secondary school" means a high and/or middle school: A school for students who have completed their primary education, usually attended by children in grades seven to twelve and recognized by the Washington state superintendent of public instruction. (22) "Unit" means an individually packaged marijuana-infused solid or liquid product meant to be eaten or swallowed, not to exceed ten servings or one hundred milligrams of active tetrahydrocannabinol (THC), or Delta 9. WAC 314-55-015 General information about marijuana licenses. (1) A person or entity must meet certain qualifications to receive a marijuana license, which are continuing qualifications in order to maintain the license. (2) All applicants and employees working in each licensed establishment must be at least twenty-one years of age. (3) Minors restricted signs must be posted at all marijuana licensed premises. (4) A marijuana license applicant may not exercise any of the privileges of a marijuana license until the board approves the license application. (5) The board will not approve any marijuana license for a location where law enforcement access, without notice or cause, is limited. This includes a personal residence. (6) The board will not approve any marijuana license for a location on federal lands. (7) The board will not approve any marijuana retailer license for a location within another business. More than one license could be located in the same building if each licensee has their own area separated by full walls with their own entrance. Product may not be commingled. (8) Every marijuana licensee must post and keep posted its license, or licenses, and any additional correspondence containing conditions and restrictions imposed by the board in a conspicuous place on the premises. (9) In approving a marijuana license, the board reserves the right to impose special conditions as to the involvement in the operations of the licensed business of any former licensees, their former employees, or any person who does not qualify for a marijuana license. (10) A marijuana processor or retailer licensed by the board shall conduct the processing, storage, and sale of marijuana-infused products using sanitary practices and ensure facilities are constructed, kept, and maintained in a clean and sanitary condition in accordance with rules and as prescribed by the Washington state department of agriculture under chapters 16-165 and 16-167 WAC. (11) Marijuana licensees may not allow the consumption of marijuana or marijuana-infused products on the licensed premises. WAC 314-55-020 Marijuana license qualifications and application process. (1) Per RCW 69.50.331, the board shall send a notice to cities and counties, and may send a notice to tribal governments or port authorities regarding the marijuana license application. The local authority has twenty days to respond with a recommendation to approve or an objection to the applicant, location, or both. (2) The board will verify that the proposed business meets the minimum requirements for the type of marijuana license requested. (3) The board will conduct an investigation of the applicants' criminal history and administrative violation history, per WAC 314-55-040 and 314-55-045. (a) The criminal history background check will consist of completion of a personal/criminal history form provided by the board and submission of fingerprints to a vendor approved by the board. The applicant will be responsible for paying all fees required by the vendor for fingerprinting. These fingerprints will be submitted to the Washington state patrol and the Federal Bureau of Investigation for comparison to their criminal records. The applicant will be responsible for paying all fees required by the Washington state patrol and the Federal Bureau of Investigation. (b) Financiers will also be subject to criminal history investigations equivalent to that of the license applicant. Financiers will also be responsible for paying all fees required for the criminal history check. Financiers must meet the three month residency requirement. (4) The board will conduct a financial investigation in order to verify the source of funds used for the acquisition and startup of the business, the applicants' right to the real and personal property, and to verify the true party(ies) of interest. (5) The board may require a demonstration by the applicant that they are familiar with marijuana laws and rules. (6) The board may conduct a final inspection of the proposed licensed business, in order to determine if the applicant has complied with all the requirements of the license requested. (7) Per RCW 69.50.331 (1)(b), all applicants applying for a marijuana license must have resided in the state of Washington for at least three months prior to application for a marijuana license. All partnerships, employee cooperatives, associations, nonprofit corporations, corporations and limited liability companies applying for a marijuana license must be formed in Washington. All members must also meet the three month residency requirement. Managers or agents who manage a licensee's place of business must also meet the three month residency requirement. (8) Submission of an operating plan that demonstrates the applicant is qualified to hold the marijuana license applied for to the satisfaction of the board. The operating plan shall include the following elements in accordance with the applicable standards in the Washington Administrative Code (WAC). After obtaining a license, the license holder must notify the board in advance of any substantial change in their operating plan. Depending on the degree of change, prior approval may be required before the change is implemented. (10) Applicants applying for a marijuana license must be current in any tax obligations to the Washington state department of revenue, as an individual or as part of any entity in which they have an ownership interest. Applicants must sign an attestation that, under penalty of denial or loss of licensure, that representation is correct. (11) The issuance or approval of a license shall not be construed as a license for, or an approval of, any violations of local rules or ordinances including, but not limited to: Building and fire codes, zoning ordinances, and business licensing requirements. (12) Upon failure to respond to the board licensing and regulation division's requests for information within the timeline provided, the application may be administratively closed or denial of the application will be sought. WAC 314-55-035 What persons or entities have to qualify for a marijuana license? A marijuana license must be issued in the name(s) of the true party(ies) of interest. All general partners and their spouses. All limited partners and spouses. All members and their spouses. All managers and their spouses. All corporate officers (or persons with equivalent title) and their spouses. All stockholders and their spouses. All persons and entities that make up the ownership structure (and their spouses). Any entity or person (inclusive of financiers) that are expecting a percentage of the profits in exchange for a monetary loan or expertise. Any entity or person who is in receipt of, or has the right to receive, a percentage of the gross or net profit from the licensed business during any full or partial calendar or fiscal year. Any entity or person who exercises control over the licensed business in exchange for money or expertise. "Gross profit" includes the entire gross receipts from all sales and services made in, upon, or from the licensed business. "Net profit" means gross sales minus cost of goods sold. All individuals and spouses, and entities having membership rights in accordance with the provisions of the articles of incorporation or the bylaws. (a) A person or entity receiving reasonable payment for rent on a fixed basis under a bona fide lease or rental obligation, unless the lessor or property manager exercises control over or participates in the management of the business. (b) A person who receives a bonus as an employee, if: The employee is on a fixed wage or salary and the bonus is not more than twenty-five percent of the employee's prebonus annual compensation; or the bonus is based on a written incentive/bonus program that is not out of the ordinary for the services rendered. (c) A person or entity contracting with the applicant(s) to sell the property, unless the contract holder exercises control over or participates in the management of the licensed business. (3) Financiers - The board will conduct a financial investigation as well as a criminal background of financiers. (4) Persons who exercise control of business - The board will conduct an investigation of any person or entity who exercises any control over the applicant's business operations. This may include both a financial investigation and/or a criminal history background. WAC 314-55-040 What criminal history might prevent a marijuana license applicant from receiving or keeping a marijuana license? (2) If a case is pending for an alleged offense that would earn eight or more points, the board will hold the application for the disposition of the case. If the disposition is not settled within ninety days, the board will administratively close the application. (a) Prior to initial license application, two federal or state misdemeanor convictions for the possession only of marijuana within the previous three years may not be applicable to the criminal history points accumulated. All criminal history must be reported on the personal/criminal history form. (ii) State misdemeanor possession convictions accrued after December 6, 2013, exceeding the allowable amounts of marijuana, usable marijuana, and marijuana-infused products described in chapter 69.50 RCW shall count toward criminal history point accumulation. (b) Prior to initial license application, any single state or federal conviction for the growing, possession, or sale of marijuana will be considered for mitigation on an individual basis. Mitigation will be considered based on the quantity of product involved and other circumstances surrounding the conviction. (4) Once licensed, marijuana licensees must report any criminal convictions to the board within fourteen days. WAC 314-55-045 What marijuana law or rule violation history might prevent an applicant from receiving a marijuana license? The board will conduct an investigation of all applicants' marijuana law or rule administrative violation history. The board will not normally issue a marijuana license to a person, or to an entity with a true party of interest, who has the following violation history; or to any person who has demonstrated a pattern of disregard for laws or rules. Violations issued within three years of the date the application is received by the board's licensing and regulation division. One to four, or more license violations. Violations issued within the last three years the true party(ies) of interest were licensed. WAC 314-55-050 Reasons the board may seek denial, suspension, or cancellation of a marijuana license application or license. (1) Failure to meet qualifications or requirements for the specific marijuana producer, processor, or retail license, as outlined in this chapter and chapter 69.50 RCW. (2) Failure or refusal to submit information or documentation requested by the board during the evaluation process. (3) The applicant makes a misrepresentation of fact, or fails to disclose a material fact to the board during the application process or any subsequent investigation after a license has been issued. (4) Failure to meet the criminal history standards outlined in WAC 314-55-040. (5) Failure to meet the marijuana law or rule violation history standards outlined in WAC 314-55-045. (6) The source of funds identified by the applicant to be used for the acquisition, startup and operation of the business is questionable, unverifiable, or determined by the board to be gained in a manner which is in violation by law. (7) Denies the board or its authorized representative access to any place where a licensed activity takes place or fails to produce any book, record or document required by law or board rule. (8) Has been denied or had a marijuana license or medical marijuana license suspended or canceled in another state or local jurisdiction. (9) Where the city, county, tribal government, or port authority has submitted a substantiated objection per the requirements in RCW 69.50.331 (7) and (9). (h) Any game arcade (where admission is not restricted to persons age twenty-one or older). (11) Has failed to pay taxes or fees required under chapter 69.50 RCW or failed to provide production, processing, inventory, sales and transportation reports to documentation required under this chapter. (12) Failure to submit an attestation that they are current in any tax obligations to the Washington state department of revenue. (13) Has been denied a liquor license or had a liquor license suspended or revoked in this or any other state. (14) The operating plan does not demonstrate, to the satisfaction of the board, the applicant is qualified for a license. (15) Failure to operate in accordance with the board approved operating plan. (16) The board determines the issuance of the license will not be in the best interest of the welfare, health, or safety of the people of the state. WAC 314-55-070 Process if the board denies a marijuana license application. (1) Request an administrative hearing per chapter 34.05 RCW, the Administrative Procedure Act. (2) Reapply for the license no sooner than one year from the date on the final order of denial. WAC 314-55-075 What is a marijuana producer license and what are the requirements and fees related to a marijuana producer license? (1) A marijuana producer license allows the licensee to produce marijuana for sale at wholesale to marijuana processor licensees and to other marijuana producer licensees. Marijuana production must take place within a fully enclosed secure indoor facility or greenhouse with rigid walls, a roof, and doors. Outdoor production may take place in nonrigid greenhouses, other structures, or an expanse of open or cleared ground fully enclosed by a physical barrier. To obscure public view of the premises, outdoor production must be enclosed by a sight obscure wall or fence at least eight feet high. Outdoor producers must meet security requirements described in WAC 314-55-083. (2) The application fee for a marijuana producer license is two hundred fifty dollars. The applicant is also responsible for paying the fees required by the approved vendor for fingerprint evaluation. (3) The annual fee for issuance and renewal of a marijuana producer license is one thousand dollars. The board will conduct random criminal history checks at the time of renewal that will require the licensee to submit fingerprints for evaluation from the approved vendor. The licensee will be responsible for all fees required for the criminal history checks. (4) The board will initially limit the opportunity to apply for a marijuana producer license to a thirty-day calendar window beginning with the effective date of this section. In order for a marijuana producer application license to be considered it must be received no later than thirty days after the effective date of the rules adopted by the board. The board may reopen the marijuana producer application window after the initial evaluation of the applications received and at subsequent times when the board deems necessary. (5) Any entity and/or principals within any entity are limited to no more than three marijuana producer licenses. (c) Tier 3 – Ten thousand square feet to thirty thousand square feet. (a) If the amount of square feet of production of all licensees exceeds the maximum of two million square feet the board will reduce the allowed square footage by the same percentage. (b) If fifty percent production space used for plant canopy in the licensee's operating plan is not met by the end of the first year of operation the board may reduce the tier of licensure. (8) If the total amount of square feet of marijuana production exceeds two million square feet, the board reserves the right to reduce all licensee's production by the same percentage or reduce licensee production by one or more tiers by the same percentage. (b) Indoor grows – Six months of their annual harvest. WAC 314-55-077 What is a marijuana processor license and what are the requirements and fees related to a marijuana processor license? (1) A marijuana processor license allows the licensee to process, package, and label usable marijuana and marijuana-infused products for sale at wholesale to marijuana retailers. (2) A marijuana processor is allowed to blend tested useable marijuana from multiple lots into a single package for sale to a marijuana retail licensee providing the label requirements for each lot used in the blend are met and the percentage by weight of each lot is also included on the label. (3) The application fee for a marijuana processor license is two hundred fifty dollars. The applicant is also responsible for paying the fees required by the approved vendor for fingerprint evaluation. (4) The annual fee for issuance and renewal of a marijuana processor license is one thousand dollars. The board will conduct random criminal history checks at the time of renewal that will require the licensee to submit fingerprints for evaluation from the approved vendor. The licensee will be responsible for all fees required for the criminal history checks. (5) The board will initially limit the opportunity to apply for a marijuana processor license to a thirty-day calendar window beginning with the effective date of this section. In order for a marijuana processor application license to be considered it must be received no later than thirty days after the effective date of the rules adopted by the board. The board may reopen the marijuana processor application window after the initial evaluation of the applications that are received and processed, and at subsequent times when the board deems necessary. (6) Any entity and/or principals within any entity are limited to no more than three marijuana processor licenses. (7) Marijuana processor licensees are allowed to have a maximum of six months of their average useable marijuana and six months average of their total production on their licensed premises at any time. WAC 314-55-079 What is a marijuana retailer license and what are the requirements and fees related to a marijuana retailer license? (1) A marijuana retailer license allows the licensee to sell only usable marijuana, marijuana-infused products, and marijuana paraphernalia at retail in retail outlets to persons twenty-one years of age and older. (2) Marijuana extracts, such as hash, hash oil, shatter, and wax can be infused in products sold in a marijuana retail store, but RCW 69.50.354 does not allow the sale of extracts that are not infused in products. A marijuana extract does not meet the definition of a marijuana-infused product per RCW 69.50.101. (3) Internet sales and delivery of product is prohibited. (4) The application fee for a marijuana retailer's license is two hundred fifty dollars. The applicant is also responsible for paying the fees required by the approved vendor for fingerprint evaluation. (5) The annual fee for issuance and renewal of a marijuana retailer's license is one thousand dollars. The board will conduct random criminal history checks at the time of renewal that will require the licensee to submit fingerprints for evaluation from the approved vendor. The licensee will be responsible for all fees required for the criminal history checks. (6) Marijuana retailers may not sell marijuana products below their acquisition cost. (7) Marijuana retailer licensees are allowed to have a maximum of four months of their average inventory on their licensed premises at any given time. WAC 314-55-081 Who can apply for a marijuana retailer license? (1) Using estimated consumption data and population data obtained from the office of financial management (OFM) population data, the liquor control board will determine the maximum number of marijuana retail locations per county. The number of retail locations will be determined using a method that distributes the number of locations proportionate to the most populous cities within each county. Locations not assigned to a specific city will be at large. At large locations can be used for unincorporated areas in the county or in cities within the county that have no retail licenses designated. Once the number of locations per city and at large have been identified, the eligible applicants will be selected by lottery in the event the number of applications exceeds the allotted amount for the cities and county. Any lottery conducted by the board will be witnessed by an independent third party. (2) The number of marijuana retail licenses determined by the board can be found on the liquor control board web site at www.liq.wa.gov. (3) Any entity and/or principals within any entity are limited to no more than three retail marijuana licenses with no multiple location licensee allowed more than thirty-three percent of the allowed licenses in any county or city. (4) The board will initially limit the opportunity to apply for a marijuana retailer license to a thirty-day calendar window beginning with the effective date of this section. In order for a marijuana retailer license application to be considered it must be received no later than thirty days after the effective date of the rules adopted by the board. The board may reopen the marijuana retailer application window after the initial evaluation of the applications received and at subsequent times when the board deems necessary. Marijuana licensees shall provide insurance coverage as set out in this section. The intent of the required insurance is to protect the consumer should there be any claims, suits, actions, costs, damages or expenses arising from any negligent or intentional act or omission of the marijuana licensees. Marijuana licensees shall furnish evidence in the form of a certificate of insurance satisfactory to the board that insurance, in the following kinds and minimum amounts, has been secured. Failure to provide proof of insurance, as required, may result in license cancellation. (1) Commercial general liability insurance: The licensee shall at all times carry and maintain commercial general liability insurance and if necessary, commercial umbrella insurance for bodily injury and property damage arising out of licensed activities. This insurance shall cover such claims as may be caused by any act, omission, or negligence of the licensee or its officers, agents, representatives, assigns, or servants. The insurance shall also cover bodily injury, including disease, illness and death, and property damage arising out of the licensee's premises/operations, products, and personal injury. The limits of liability insurance shall not be less than one million dollars. (2) Insurance carrier rating: The insurance required in subsection (1) of this section shall be issued by an insurance company authorized to do business within the state of Washington. Insurance is to be placed with a carrier that has a rating of A - Class VII or better in the most recently published edition of Best's Reports. If an insurer is not admitted, all insurance policies and procedures for issuing the insurance policies must comply with chapters 48.15 RCW and 284-15 WAC. (3) Additional insured. The board shall be named as an additional insured on all general liability, umbrella, and excess insurance policies. All policies shall be primary over any other valid and collectable insurance. WAC 314-55-083 What are the security requirements for a marijuana licensee? (1) Display of identification badge. All employees on the licensed premises shall be required to hold and properly display an identification badge issued by the licensed employer at all times while on the licensed premises. (2) Alarm systems. At a minimum, each licensed premises must have a security alarm system on all perimeter entry points and perimeter windows. Motion detectors, pressure switches, duress, panic, and hold-up alarms may also be utilized. (3) Surveillance system. At a minimum, a complete video surveillance with minimum camera resolution of 640x470 pixel and must be internet protocol (IP) compatible and recording system for controlled areas within the licensed premises and entire perimeter fencing and gates enclosing an outdoor grow operation, to ensure control of the area. The requirements include image acquisition, video recording, management and monitoring hardware and support systems. All recorded images must clearly and accurately display the time and date. Time is to be measured in accordance with the U.S. National Institute Standards and Technology standards. (a) All controlled access areas, security rooms/areas and all points of ingress/egress to limited access areas, all points of ingress/egress to the exterior of the licensed premises, and all point-of-sale (POS) areas must have fixed camera coverage capable of identifying activity occurring within a minimum of twenty feet of all entry and exit points. (b) Camera placement shall allow for the clear and certain identification of any individual on the licensed premises. (c) All entrances and exits to the facility shall be recorded from both indoor and outdoor vantage points, and capable of clearly identifying any activities occurring within the facility or within the grow rooms in low light conditions. The surveillance system storage device must be secured on-site in a lock box, cabinet, closet, or secured in another manner to protect from employee tampering or criminal theft. (d) All perimeter fencing and gates enclosing an outdoor grow operation must have full video surveillance capable of clearly identifying any activities occurring within twenty feet of the exterior of the perimeter. Any gate or other entry point that is part of the enclosure for an outdoor growing operation must have fixed camera coverage capable of identifying activity occurring within a minimum of twenty feet of the exterior, twenty-four hours a day. A motion detection lighting system may be employed to illuminate the gate area in low light conditions. (e) Areas where marijuana is grown, cured or manufactured including destroying waste, shall have a camera placement in the room facing the primary entry door, and in adequate fixed positions, at a height which will provide a clear, unobstructed view of the regular activity without a sight blockage from lighting hoods, fixtures, or other equipment, allowing for the clear and certain identification of persons and activities at all times. (f) All marijuana or marijuana-infused products that are intended to be removed or transported from marijuana producer to marijuana processor and/or marijuana processor to marijuana retailer shall be staged in an area known as the "quarantine" location for a minimum of twenty-four hours. Transport manifest with product information and weights must be affixed to the product. At no time during the quarantine period can the product be handled or moved under any circumstances and is subject to auditing by the liquor control board or designees. (g) All camera recordings must be continuously recorded twenty-four hours a day. All surveillance recordings must be kept for a minimum of forty-five days on the licensee's recording device. All videos are subject to inspection by any liquor control board employee or law enforcement officer, and must be copied and provided to the board or law enforcement officer upon request. (h) There is a twenty-four hour mandatory waiting period after the notification described in this subsection to allow for inspection before useable marijuana, or marijuana-infused products are transported from a processor to a retailer. (r) Other information specified by the board. (5) Start-up inventory for marijuana producers. Within fifteen days of starting production operations a producer must have all nonflowering marijuana plants physically on the licensed premises. The producer must immediately record each marijuana plant that enters the facility in the traceability system during this fifteen day time frame. No flowering marijuana plants may be brought into the facility during this fifteen day time frame. After this fifteen day time frame expires, a producer may only start plants from seed or create clones from a marijuana plant located physically on their licensed premises, or purchase marijuana seeds, clones, or plants from another licensed producer. (6) Samples. Free samples of usable marijuana may be provided by producers or processors, or used for product quality testing, as set forth in this section. (a) Samples are limited to two grams and a producer may not provide any one licensed processor more than four grams of usable marijuana per month free of charge for the purpose of negotiating a sale. The producer must record the amount of each sample and the processor receiving the sample in the traceability system. (b) Samples are limited to two grams and a processor may not provide any one licensed retailer more than four grams of usable marijuana per month free of charge for the purpose of negotiating a sale. The processor must record the amount of each sample and the retailer receiving the sample in the traceability system. (c) Samples are limited to two units and a processor may not provide any one licensed retailer more than six ounces of marijuana infused in solid form per month free of charge for the purpose of negotiating a sale. The processor must record the amount of each sample and the retailer receiving the sample in the traceability system. (d) Samples are limited to two units and a processor may not provide any one licensed retailer more than twenty-four ounces of marijuana-infused liquid per month free of charge for the purpose of negotiating a sale. The processor must record the amount of each sample and the retailer receiving the sample in the traceability system. (e) Samples are limited to one-half gram and a processor may not provide any one licensed retailer more than one gram of marijuana-infused extract meant for inhalation per month free of charge for the purpose of negotiating a sale. The processor must record the amount of each sample and the retailer receiving the sample in the traceability system. (f) Producers may sample one gram of useable marijuana per strain, per month for quality sampling. Sampling for quality may not take place at a licensed premises. Only the producer or employees of the licensee may sample the useable marijuana for quality. The producer must record the amount of each sample and the employee(s) conducting the sampling in the traceability system. (g) Processors may sample one unit, per batch of a new edible marijuana-infused product to be offered for sale on the market. Sampling for quality may not take place at a licensed premises. Only the processor or employees of the licensee may sample the edible marijuana-infused product. The processor must record the amount of each sample and the employee(s) conducting the sampling in the traceability system. (h) Processors may sample up to one quarter gram, per batch of a new marijuana-infused extract for inhalation to be offered for sale on the market. Sampling for quality may not take place at a licensed premises. Only the processor or employee(s) of the licensee may sample the marijuana-infused extract for inhalation. The processor must record the amount of each sample and the employee(s) conducting the sampling in the traceability system. (i) The limits described in subsection (3) of this section do not apply to the usable marijuana in sample jars that may be provided to retailers described in WAC 314-55-105(8). (j) Retailers may not provide free samples to customers. WAC 314-55-084 Production of marijuana. (1) Materials listed or registered by the Washington state department of agriculture (WSDA) or Organic Materials Review Institute (OMRI) as allowable for use in organic production, processing, and handling under the U.S. Department of Agriculture's national organics standards, also called the National Organic Program (NOP), consistent with requirements at 7 C.F.R. Part 205. (2) Pesticides registered by WSDA under chapter 15.58 RCW as allowed for use in the production, processing, and handling of marijuana. Pesticides must be used consistent with the label requirements. (3) Commercial fertilizers registered by WSDA under chapter 15.54 RCW. (4) Potting soil and other growing media available commercially in the state of Washington may be used in marijuana production. Producers growing outdoors are not required to meet land eligibility requirements outlined in 7 C.F.R. Part 205.202. WAC 314-55-085 What are the transportation requirements for a marijuana licensee? (1) Notification of shipment. Upon transporting any marijuana or marijuana product, a producer, processor or retailer shall notify the board of the type and amount and/or weight of marijuana and/or marijuana products being transported, the name of transporter, times of departure and expected delivery. This information must be reported in the traceability system described in WAC 314-55-083(4). (2) Receipt of shipment. Upon receiving the shipment, the licensee receiving the product shall report the amount and/or weight of marijuana and/or marijuana products received in the traceability system. (3) Transportation manifest. A complete transport manifest containing all information required by the board must be kept with the product at all times. (4) Records of transportation. Records of all transportation must be kept for a minimum of three years at the licensee's location. (e) Any vehicle transporting marijuana or marijuana products must travel directly from the shipping licensee to the receiving licensee and must not make any unnecessary stops in between except to other facilities receiving product. WAC 314-55-086 What are the mandatory signs a marijuana licensee must post on a licensed premises? The board will provide the required notices, or licensees may design their own notices as long as they are legible and contain the required language. (3) The premises' current and valid master license with appropriate endorsements must be conspicuously posted on the premises and available for inspection by liquor enforcement officers. WAC 314-55-087 What are the recordkeeping requirements for marijuana licensees? (v) For outdoor production, the concentration of pesticide that was applied to the field. Liquid applications may be recorded as, but are not limited to, amount of product per one hundred gallons of liquid spray, gallons per acre of output volume, ppm, percent product in tank mix (e.g., one percent). For chemigation applications, record "inches of water applied" or other appropriate measure. (p) Records of any theft of marijuana seedlings, clones, plants, trim or other plant material, extract, marijuana-infused product, or other item containing marijuana. (a) Provides an audit trail so that details (invoices and vouchers) underlying the summary accounting data may be identified and made available upon request. (b) Provides the opportunity to trace any transaction back to the original source or forward to a final total. If printouts of transactions are not made when they are processed, the system must have the ability to reconstruct these transactions. (c) Has available a full description of the ADP and/or POS portion of the accounting system. This should show the applications being performed, the procedures employed in each application, and the controls used to ensure accurate and reliable processing. (3) The provisions contained in subsections (1) and (2) of this section do not eliminate the requirement to maintain source documents, but they do allow the source documents to be maintained in some other location. WAC 314-55-089 What are the tax and reporting requirements for marijuana licensees? (e) All records must be maintained and available for review for a three-year period on licensed premises (see WAC 314-55-087). (2) Marijuana producer licensees: On a monthly basis, marijuana producers must maintain records and report purchases from other licensed marijuana producers, current production and inventory on hand, sales by product type, and lost and destroyed product in a manner prescribed by the board. A marijuana producer licensee must pay to the board a marijuana excise tax of twenty-five percent of the selling price on each wholesale sale to a licensed marijuana processor. (3) Marijuana processor licensees: On a monthly basis, marijuana processors must maintain records and report purchases from licensed marijuana producers, production of marijuana-infused products, sales by product type to marijuana retailers, and lost and/or destroyed product in a manner prescribed by the board. A marijuana processor licensee must pay to the board a marijuana excise tax of twenty-five percent of the selling price on each wholesale sale of usable marijuana and marijuana-infused product to a licensed marijuana retailer. (4) Marijuana retailer's licensees: On a monthly basis, marijuana retailers must maintain records and report purchases from licensed marijuana processors, sales by product type to consumers, and lost and/or destroyed product in a manner prescribed by the board. A marijuana retailer licensee must pay to the board a marijuana excise tax of twenty-five percent of the selling price on each retail sale of usable marijuana or marijuana-infused products. WAC 314-55-092 What if a marijuana licensee fails to report or pay, or reports or pays late? (1) If a marijuana licensee does not submit its monthly reports and payment(s) to the board as required in WAC 314-55-089: The licensee is subject to penalties. Penalties: A penalty of two percent per month will be assessed on any payments postmarked after the twentieth day of the month following the month of sale. When the twentieth day of the month falls on a Saturday, Sunday, or a legal holiday, the filing must be postmarked by the U.S. Postal Service no later than the next postal business day. (2) Failure to make a report and/or pay the license taxes and/or penalties in the manner and dates outlined in WAC 314-55-089 will be sufficient grounds for the board to suspend or revoke a marijuana license. WAC 314-55-095 Marijuana servings and transaction limitations. (1) Single serving. A single serving of a marijuana-infused product amounts to ten milligrams active tetrahydrocannabinol (THC), or Delta 9. (2) Maximum number of servings. The maximum number of servings in any one single unit of marijuana-infused product meant to be eaten or swallowed is ten servings or one hundred milligrams of active THC, or Delta 9. A single unit of marijuana-infused extract for inhalation cannot exceed one gram. (3) Transaction limitation. A single transaction is limited to one ounce of usable marijuana, sixteen ounces of marijuana-infused product in solid form, seven grams of marijuana-infused extract for inhalation, and seventy-two ounces of marijuana-infused product in liquid form for persons twenty-one years of age and older. WAC 314-55-097 Marijuana waste disposal—Liquids and solids. (1) Solid and liquid wastes generated during marijuana production and processing must be stored, managed, and disposed of in accordance with applicable state and local laws and regulations. (2) Wastewater generated during marijuana production and processing must be disposed of in compliance with applicable state and local laws and regulations. (3) Wastes from the production and processing of marijuana plants must be evaluated against the state's dangerous waste regulations (chapter 173-303 WAC) to determine if those wastes designate as dangerous waste. It is the responsibility of each waste generator to properly evaluate their waste to determine if it designates as a dangerous waste. If a generator's waste does designate as a dangerous waste, then that waste(s) is subject to the applicable management standards found in chapter 173-303 WAC. (i) Waste from marijuana flowers, trim and solid plant material used to create an extract (per WAC 315-55-104). (ii) Waste solvents used in the marijuana process (per WAC 315-55-104). (iii) Discarded plant waste, spent solvents and laboratory wastes from any marijuana processing or quality assurance testing. (iv) Marijuana extract that fails to meet quality testing. (b) Marijuana wastes that do not designate as dangerous shall be managed in accordance with subsection (4) of this section. (c) A marijuana plant, usable marijuana, trim and other plant material in itself is not considered dangerous waste as defined under chapter 173-303 WAC unless it has been treated or contaminated with a solvent. (4) Marijuana waste that does not designate as dangerous waste (per subsection (3) of this section) must be rendered unusable following the methods in subsection (5) of this section prior to leaving a licensed producer, processor, retail facility, or laboratory. Disposal of the marijuana waste rendered unusable must follow the methods under subsection (6) of this section. (i) Waste evaluated per subsection (3) of this section and determined to not designate as "Dangerous Waste." (ii) Marijuana plant waste, including roots, stalks, leaves, and stems that have not been processed with solvent. (iii) Solid marijuana sample plant waste possessed by third-party laboratories accredited by the board to test for quality assurance that must be disposed of. (iv) Other wastes as determined by the LCB. (b) A producer or processor must provide the board a minimum of seventy-two hours notice in the traceability system described in WAC 314-55-083(4) prior to rendering the product unusable and disposing of it. (5) The allowable method to render marijuana plant waste unusable is by grinding and incorporating the marijuana plant waste with other ground materials so the resulting mixture is at least fifty percent nonmarijuana waste by volume. Other methods to render marijuana waste unusable must be approved by LCB before implementation. Material used to grind with the marijuana falls into two categories: Compostable waste and noncompostable waste. (iv) Other wastes as approved by the LCB. (v) Other wastes as approved by the LCB. (6) Marijuana wastes rendered unusable following the method described in subsection (4) of this section can be disposed. (i) Compostable mixed waste: Compost, anaerobic digester, or other facility with approval of the jurisdictional health department. (ii) Noncompostable mixed waste: Landfill, incinerator, or other facility with approval of the jurisdictional health department. (b) Disposal of the marijuana waste rendered unusable may be managed on-site by the generator in accordance with the standards of chapter 173-350 WAC. (c) A record of the final destination of marijuana waste rendered unusable. (1) Marijuana producer and processor licensees must have at least one scale on the licensed premises for the traceability and inventory of products. (2) The scales and other measuring devices are subject to chapter 19.94 RCW, and must meet the requirements of the most current version of chapters 16-662 and 16-664 WAC. (3) Licensees must register scales on a business license application with business license services through the department of revenue as required under chapter 19.94 RCW. WAC 314-55-102 Quality assurance testing. (1) A person with financial interest in an accredited third-party testing lab may not have direct or indirect financial interest in a licensed marijuana producer or processor for whom they are conducting required quality assurance tests. (c) Has earned a bachelor's degree in the chemical or biological sciences and has a minimum of six years of post-education laboratory experience. (3) As a condition of accreditation, labs must follow the most current version of the Cannabis Inflorescence and Leaf monograph published by the American Herbal Pharmacopoeia or notify the board what alternative scientifically valid testing methodology the lab is following for each quality assurance test. The board may require third-party validation of any monograph or analytical method followed by the lab to ensure the methodology produces scientifically accurate results prior to them using those standards when conducting required quality assurance tests. (4) As a condition of accreditation, the board may require third-party validation and ongoing monitoring of a lab's basic proficiency to correctly execute the analytical methodologies employed by the lab. (5) Labs must adopt and follow minimum good lab practices (GLPs), and maintain internal standard operating procedures (SOPs), and a quality control/quality assurance (QC/QA) program as specified by the board. The board or authorized third-party organization can conduct audits of a lab's GLPs, SOPs, QC/QA, and inspect all other related records. (6) The general body of required quality assurance tests for marijuana flowers, infused products, and extracts may include moisture content, potency analysis, foreign matter inspection, microbiological screening, pesticide and other chemical residue and metals screening, and residual solvents levels. (7) Table of required quality assurance tests. (8) Independent testing labs may request additional sample material in excess of amounts listed in the table in subsection (7) of this section for the purposes of completing required quality assurance tests. Labs meeting the board's accreditation requirements may retrieve samples from a marijuana licensee's licensed premises and transport the samples directly to the lab. (9) Labs meeting the board's accreditation requirements are not limited in the amount of useable marijuana and marijuana products they may have on their premises at any given time, but they must have records to prove all marijuana and marijuana-infused products only for the testing purposes described in WAC 314-55-102. (10) At the discretion of the board, a producer or processor must provide an employee of the board or their designee samples in the amount listed in subsection (7) of this section for random compliance checks. Samples may be screened for pesticides and chemical residues, unsafe levels of metals, and used for other quality assurance tests deemed necessary by the board. All costs of this testing will be borne by the producer or processor. (11) No lot of usable flower or batch of marijuana-infused product may be sold or transported until the completion of all required quality assurance testing. (12) Any useable marijuana or marijuana-infused product that passed the required quality assurance tests may be labeled as "Class A." Only "Class A" useable marijuana or marijuana-infused product will be allowed to be sold. (13) If a lot of marijuana flowers fail a quality assurance test, any marijuana plant trim, leaf and other usable material from the same plants automatically fails quality assurance testing also. Upon approval of the board, a lot that fails a quality assurance test may be used to make a CO2 or solvent based extract. After processing, the CO2 or solvent based extract must still pass all required quality assurance tests in WAC 314-55-102. (14) At the request of the producer or processor, the board may authorize a retest to validate a failed test result on a case-by-case basis. All costs of the retest will be borne by the producer or the processor. WAC 314-55-104 Marijuana processor license extraction requirements. (1) Processors are limited to certain methods, equipment, solvents, gases and mediums when creating marijuana extracts. (2) Processors may use the hydrocarbons N-butane, isobutane, propane, or heptane or other solvents or gases exhibiting low to minimal potential human health-related toxicity approved by the board. These solvents must be of at least ninety-nine percent purity and a processor must use them in a professional grade closed loop extraction system designed to recover the solvents, work in a spark free environment with proper ventilation, and follow all applicable local fire, safety and building codes in processing and the storage of the solvents. (3) Processors may use a professional grade closed loop CO2 gas extraction system where every vessel is rated to a minimum of nine hundred pounds per square inch and follow all applicable local fire, safety and building codes in processing and the storage of the solvents. The CO2 must be of at least ninety-nine percent purity. (4) Processors may use heat, screens, presses, steam distillation, ice water, and other methods without employing solvents or gases to create kief, hashish, bubble hash, or infused dairy butter, or oils or fats derived from natural sources, and other extracts. (5) Processors may use food grade glycerin, ethanol, and propylene glycol solvents to create extracts. (6) Processors creating marijuana extracts must develop standard operating procedures, good manufacturing practices, and a training plan prior to producing extracts for the marketplace. Any person using solvents or gases in a closed looped system to create marijuana extracts must be fully trained on how to use the system, have direct access to applicable material safety data sheets and handle and store the solvents and gases safely. (7) Parts per million for one gram of finished extract cannot exceed 500 parts per million or residual solvent or gas when quality assurance tested per RCW 69.50.348. WAC 314-55-105 Packaging and labeling requirements. (1) All usable marijuana and marijuana products must be stored behind a counter or other barrier to ensure a customer does not have direct access to the product. (2) Any container or packaging containing usable marijuana or marijuana products must protect the product from contamination and must not impart any toxic or deleterious substance to the usable marijuana or marijuana product. (3) Upon the request of a retail customer, a retailer must disclose the name of the accredited third-party testing lab and results of the required quality assurance test for any usable marijuana or other marijuana product the customer is considering purchasing. (4) usable marijuana and marijuana products may not be labeled as organic unless permitted by the United States Department of Agriculture in accordance with the Organic Foods Production Act. (5) The accredited third-party testing lab and required results of the quality assurance test must be included with each lot and disclosed to the customer buying the lot. (c) Weight of the product. (7) Marijuana-infused products meant to be eaten, swallowed, or inhaled, must be packaged in child resistant packaging in accordance with Title 16 C.F.R. 1700 of the Poison Prevention Packaging Act or use standards specified in this subsection. Marijuana-infused product in solid or liquid form may be packaged in plastic four mil or greater in thickness and be heat sealed with no easy-open tab, dimple, corner, or flap as to make it difficult for a child to open and as a tamperproof measure. Marijuana-infused product in liquid form may also be sealed using a metal crown cork style bottle cap. (8) A processor may provide a retailer free samples of usable marijuana packaged in a sample jar protected by a plastic or metal mesh screen to allow customers to smell the product before purchase. The sample jar may not contain more than three and one-half grams of usable marijuana. 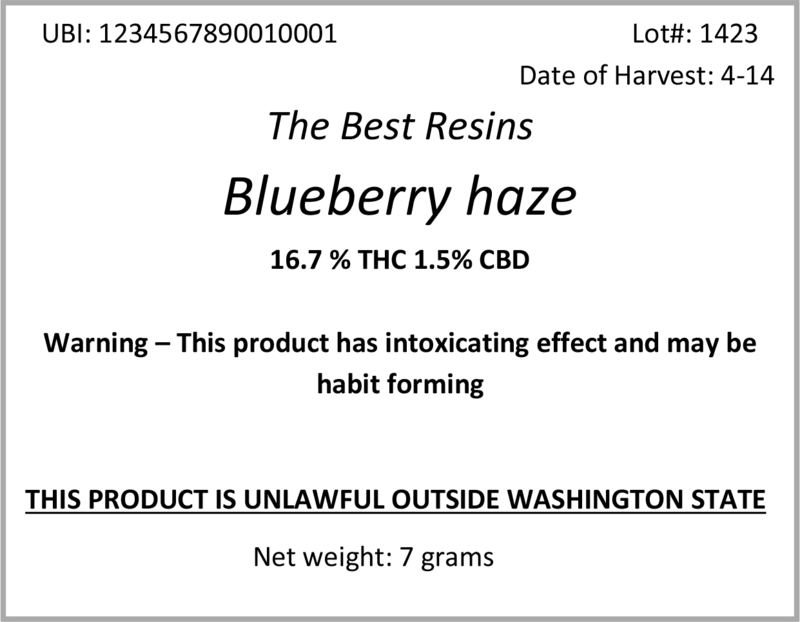 The sample jar and the usable marijuana within may not be sold to a customer and must be either returned to the licensed processor who provide the usable marijuana and sample jar or destroyed by the retailer after use in the manner described in WAC 314-55-097 and noted in the traceability system. (9) A producer or processor may not treat or otherwise adulterate usable marijuana with any organic or nonorganic chemical or other compound whatsoever to alter the color, appearance, weight, or smell of the usable marijuana. (10) Labels must comply with the version of NIST Handbook 130, Uniform Packaging and Labeling Regulation adopted in chapter 16-662 WAC. (f) Statement that discloses all pesticides applied to the marijuana plants and growing medium during production and processing. (h) Statement that discloses the type of extraction method, including any solvents, gases, or other chemicals or compounds used to produce or that are added to the extract. (h) The board may create a logo that must be placed on all usable marijuana and marijuana-infused products. (i) "Caution: When eaten or swallowed, the intoxicating effects of this drug may be delayed by two or more hours." (m) The board may create a logo that must be placed on all usable marijuana and marijuana-infused products. Change in the qualifying persons in a: Sole proprietorship, general partnership, limited partnership, or limited liability partnership. Application fee and annual fee for current license privilege. Change in the qualifying persons for a publicly or privately held corporation. The board will waive the fee for a corporate change when the proposed change consists solely of dropping an approved officer. Application for change in corporate officer and/or stockholder. Change in the qualifying persons in a limited liability company. Application for change of limited liability company member and/or manager. (2) The board may inquire into all matters in connection with any such sale of stock/units or proposed change in officers/members. WAC 314-55-125 Change of location. (1) Changing your marijuana license to a new location requires an application, per the process outlined in WAC 314-55-020. (2) A change of location occurs any time a move by the licensee results in any change to the physical location address. WAC 314-55-130 Change of business name. (1) If you wish to change the name of your business, you must apply for a change of trade name with the department of revenue, business license service. (2) If you wish to change your corporation or limited liability company name, you must apply for a change of name through the secretary of state. (3) See chapter 434-12 WAC for guidelines for trade names. WAC 314-55-135 Discontinue marijuana sales. You must notify the board's enforcement and education division in writing if you plan to stop doing business for more than thirty days, or if you plan to permanently discontinue marijuana sales. WAC 314-55-140 Death or incapacity of a marijuana licensee. (1) The appointed guardian, executor, administrator, receiver, trustee, or assignee must notify the board's licensing and regulation division in the event of the death, incapacity, receivership, bankruptcy, or assignment for benefit of creditors of any licensee. (2) The board may give the appointed guardian, executor, administrator, receiver, trustee, or assignee written approval to continue marijuana sales on the licensed business premises for the duration of the existing license and to renew the license when it expires. (a) The person must be a resident of the state of Washington. (b) A criminal background check may be required. (3) When the matter is resolved by the court, the true party(ies) of interest must apply for a marijuana license for the business. WAC 314-55-145 Are marijuana license fees refundable? When a license is suspended or canceled, or the licensed business is discontinued, the unused portion of the marijuana license fee will not be refunded. WAC 314-55-147 What hours may a marijuana retailer licensee conduct sales? A marijuana retailer licensee may sell usable marijuana, marijuana-infused products, and marijuana paraphernalia between the hours of 8 a.m. and 12 a.m.
WAC 314-55-150 What are the forms of acceptable identification? (e) Enrollment card issued by the governing authority of a federally recognized Indian tribe located in Washington, if the enrollment card incorporates security features comparable to those implemented by the department of licensing for Washington driver's licenses. (2) The identification document is not acceptable to verify age if expired. (1) Advertising by retail licensees. The board limits each retail licensed premises to one sign identifying the retail outlet by the licensee's business name or trade name that is affixed or hanging in the windows or on the outside of the premises that is visible to the general public from the public right of way. The size of the sign is limited to sixteen hundred square inches. (ii) Is designed in any manner that would be especially appealing to children or other persons under twenty-one years of age. (c) On or in a publicly owned or operated property. (4) Giveaways, coupons, and distribution of branded merchandise are banned. (d) "For use only by adults twenty-one and older. Keep out of the reach of children." WAC 314-55-160 Objections to marijuana license applications. (1) How can persons, cities, counties, tribal governments, or port authorities object to the issuance of a marijuana license? Per RCW 69.50.331, the board will notify cities, counties, tribal governments, and port authorities of the following types of marijuana applications. In addition to these entities, any person or group may comment in writing to the board regarding an application. Applications for an annual marijuana license at a new location. Cities and counties in which the premises is located will be notified. Tribal governments and port authorities in which the premises is located may be notified. Applications to change the class of an existing annual marijuana license. Changes of ownership at existing licensed premises. (2) What will happen if a person or entity objects to a marijuana license application? When deciding whether to issue or deny a marijuana license application, the board will give substantial weight to input from governmental jurisdictions in which the premises is located based upon chronic illegal activity associated with the applicant's operations of the premises proposed to be licensed or the applicant's operation of any other licensed premises; and other persons or groups. Note: Per RCW 69.50.331, the board shall not issue a new marijuana license if any of the following are within one thousand feet of the premises to be licensed: Any elementary or secondary schools, playgrounds, recreation centers or facilities, child care centers, public parks, public transit centers, libraries, game arcade where admission is not restricted to persons twenty-one years of age or older. (a) If the board contemplates issuing a license over the objection of a governmental jurisdiction in which the premises is located, the government subdivision may request an adjudicative hearing under the provisions of the Administrative Procedure Act, chapter 34.05 RCW. If the board, in its discretion, grants the governmental jurisdiction(s) an adjudicative hearing, the applicant will be notified and given the opportunity to present evidence at the hearing. (ii) Submit a written request on a form provided by the board for an adjudicative hearing under the provisions of the Administrative Procedure Act, chapter 34.05 RCW. The request must be received within twenty days of the date the intent to deny notification was mailed. WAC 314-55-165 Objections to marijuana license renewals. (1) How can local cities, counties, tribal governments, or port authorities object to the renewal of a marijuana license? (a) The board will give governmental jurisdictions approximately ninety days written notice of premises that hold annual marijuana licenses in that jurisdiction that are up for renewal. (b) Per RCW 69.50.331, if a county, city, tribal government, or port authority wants to object to the renewal of a marijuana license in its jurisdiction, it must submit a letter to the board detailing the reason(s) for the objection and a statement of all facts on which the objections are based. (c) The county, city, tribal government, or port authority may submit a written request to the board for an extension for good cause shown. (d) This letter must be received by the board at least thirty days before the marijuana license expires. The objection must state specific reasons and facts that show issuance of the marijuana license at the proposed location or to the applicant business how it will detrimentally impact the safety, health, or welfare of the community. (e) If the objection is received within thirty days of the expiration date or the licensee has already renewed the license, the objection will be considered as a complaint and possible license revocation may be pursued by the enforcement division. (f) Objections from the public will be referred to the appropriate city, county, tribal government, or port authority for action under subsection (2) of this section. Upon receipt of the objection, the board licensing and regulation division will acknowledge receipt of the objection(s) and forward to the appropriate city, county, tribal government, or port authority. Such jurisdiction may or may not, based on the public objection, request nonrenewal. (2) What will happen if a city, county, tribal government, or port authority objects to the renewal of a marijuana license? The board will give substantial weight to a city, county, tribal government, or port authority objection to a marijuana license renewal of a premises in its jurisdiction based upon chronic illegal activity associated with the licensee's operation of the premises. Based on the jurisdiction's input and any information in the licensing file, the board will decide to either renew the marijuana license, or to pursue nonrenewal. (i) The board will notify the jurisdiction(s) in writing of its intent to renew the license, stating the reason for this decision. (i) The board will notify the licensee in writing of its intent to not renew the license, stating the reason for this decision. (ii) The jurisdiction(s) may contest the renewal and request an adjudicative hearing under the provisions of the Administrative Procedure Act (chapter 34.05 RCW) by submitting a written request on a form provided by the board. The request must be received within twenty days of the date the intent to renew notification was mailed. If the board, in its discretion, grants the governmental jurisdiction(s) an adjudicative hearing, the applicant will be notified and given the opportunity to present evidence at the hearing. (ii) The licensee may contest the nonrenewal action and request an adjudicative hearing under the provisions of the Administrative Procedure Act (chapter 34.05 RCW) by submitting a written request on a form provided by the board. The request must be received within twenty days of the date the intent to deny notification was mailed. (iii) If the licensee requests a hearing, the governmental jurisdiction will be notified. (iv) During the hearing and any subsequent appeal process, the licensee is issued a temporary operating permit for the marijuana license until a final decision is made. WAC 314-55-505 What are the procedures for notifying a licensee of an alleged violation of a liquor control board statute or regulation? (1) When an enforcement officer believes that a licensee has violated a board statute or regulation, the officer may prepare an administrative violation notice (AVN) and mail or deliver the notice to the licensee, licensee's agent, or employee. (i) If the recommended penalty is the standard penalty, see WAC 314-55-520 through 314-55-535 for licensees. (ii) For cases in which there are aggravating or mitigating circumstances, the penalty may be adjusted from the standard penalty. WAC 314-55-506 What is the process once the board summarily suspends a marijuana license? (1) The board may summarily suspend any license after the board's enforcement division has completed a preliminary staff investigation of the violation and upon a determination that immediate cessation of the licensed activities is necessary for the protection or preservation of the public health, safety, or welfare. (2) Suspension of any license under this provision shall take effect immediately upon personal service on the licensee or employee thereof of the summary suspension order unless otherwise provided in the order. (3) When a license has been summarily suspended by the board, an adjudicative proceeding for revocation or other action must be promptly instituted before an administrative law judge assigned by the office of administrative hearings. If a request for an administrative hearing is timely filed by the licensee or permit holder, then a hearing shall be held within ninety days of the effective date of the summary suspension ordered by the board. WAC 314-55-507 How may a licensee challenge the summary suspension of his or her marijuana license? (1) Upon summary suspension of a license by the board pursuant to WAC 314-55-506, an affected licensee may petition the board for a stay of suspension pursuant to RCW 34.05.467 and 34.05.550(1). A petition for a stay of suspension must be received by the board within fifteen days of service of the summary suspension order. The petition for stay shall state the basis on which the stay is sought. (2) A hearing shall be held before an administrative law judge within fourteen days of receipt of a timely petition for stay. The hearing shall be limited to consideration of whether a stay should be granted, or whether the terms of the suspension may be modified to allow the conduct of limited activities under current licenses or permits. (d) The threat to the public health, safety, or welfare is not sufficiently serious to justify continuation of the suspension, or that modification of the terms of the suspension will adequately protect the public interest. (4) The initial order on stay shall be effective immediately upon service unless another date is specified in the order. WAC 314-55-508 Review of orders on stay. (1) The licensee, or agency, may petition the board for review of an initial order on stay. Any petition for review must be in writing and received by the board within ten days of service of the initial order. If neither party has requested review within ten days of service, the initial order shall be deemed the final order of the board for purposes of RCW 34.05.467. (2) If the board receives a timely petition for review, the board shall consider the petition within fifteen days of service of the petition for review. Consideration on review shall be limited to the record of the hearing on stay. (3) The order of the board on the petition for review shall be effective upon personal service unless another date is specified in the order and is final pursuant to RCW 34.05.467. Final disposition of the petition for stay shall not affect subsequent administrative proceedings for suspension or revocation of a license. WAC 314-55-510 What options does a licensee have once he/she receives a notice of an administrative violation? (c) Request an administrative hearing in writing. A response must be submitted on a form provided by the agency. (2) What happens if a licensee does not respond to the administrative violation notice within twenty days? (a) If a licensee does not respond to the administrative violation notice within twenty days, the recommended suspension penalty will go into effect. (b) If the penalty does not include a suspension, the licensee must pay a twenty-five percent late fee in addition to the recommended penalty. The recommended penalty plus the late fee must be received within thirty days of the violation notice issue date. (3) What are the procedures when a licensee requests a settlement conference? (a) If the licensee requests a settlement conference, the hearing examiner or designee will contact the licensee to discuss the violation. (b) Both the licensee and the hearing examiner or designee will discuss the circumstances surrounding the charge, the recommended penalty, and any aggravating or mitigating factors. (c) If a compromise is reached, the hearing examiner or designee will prepare a compromise settlement agreement. The hearing examiner or designee will forward the compromise settlement agreement, authorized by both parties, to the board, or designee, for approval. (i) If the board, or designee, approves the compromise, a copy of the signed settlement agreement will be sent to the licensee and will become part of the licensing history. (ii) If the board, or designee, does not approve the compromise, the licensee will be notified of the decision. The licensee will be given the option to renegotiate with the hearings examiner or designee, of accepting the originally recommended penalty, or of requesting an administrative hearing on the charges. (d) If the licensee and the hearing examiner or designee cannot reach agreement on a settlement proposal, the licensee may accept the originally recommended penalty, or the hearing examiner or designee will forward a request for an administrative hearing to the board's hearings coordinator. WAC 314-55-515 What are the penalties if a marijuana license holder violates a marijuana law or rule? (d) Group Four—Producer violations involving the manufacture, supply, and/or distribution of marijuana by nonretail licensees and prohibited practices between nonretail licensees and retail licensees, WAC 314-55-535. (4) The following schedules are meant to serve as guidelines. Based on mitigating or aggravating circumstances, the liquor control board may impose a different penalty than the standard penalties outlined in these schedules. Based on mitigating circumstances, the board may offer a monetary option in lieu of suspension, or alternate penalty, during a settlement conference as outlined in WAC 314-55-510(3). • Failing to call 911 for local law enforcement or medical assistance when requested by a customer, a liquor control board officer, or when people have sustained injuries. WAC 314-55-520 Group 1 violations against public safety. Group 1 violations are considered the most serious because they present a direct threat to public safety. Based on chapter 69.50 RCW, some violations have only a monetary option. Some violations beyond the first violation do not have a monetary option upon issuance of a violation notice. The liquor control board may offer a monetary option in lieu of suspension days based on mitigating circumstances as outlined in WAC 314-55-515(4). Allowing a minor to frequent a restricted area. Licensee and/or employee open and/or consuming marijuana on a retail licensed premises. Conduct violations: Criminal conduct: Permitting or engaging in criminal conduct. Using unauthorized pesticides, soil amendments, fertilizers, other crop production aids. Refusal to allow an inspection and/or obstructing a law enforcement officer from performing their official duties. Marijuana purchased from an unauthorized source. Marijuana sold to an unauthorized source. Sales in excess of transaction limitations. WAC 314-55-525 Group 2 regulatory violations. Group 2 violations are violations involving general regulation and administration of retail or nonretail licenses. Hours of service: Sales of marijuana between 12:00 a.m. and 8:00 a.m.
Advertising violations – Sign exceeding 1600 square inches; within 1000 feet of prohibited areas; on or in public transit vehicles, shelters, or publicly owned or operated property. Packaging and/or labeling violations (processor/retailer). Licensee/employee failing to display required security badge. Failure to maintain required security alarm and surveillance systems. Failure to submit monthly tax reports and/or payments. Signs: Failure to post required signs. Failure to utilize and/or maintain traceability (processor or retail licensee). Exceeding maximum serving requirements for marijuana-infused products. Failure for a processor to meet marijuana waste disposal requirements. Failure to maintain standardized scale requirements (processor/retailer). Retail outlet selling unauthorized products. Retailer displaying products in a manner visible to the general public from a public right of way. WAC 314-55-530 Group 3 license violations. Group 3 violations are violations involving licensing requirements, license classification, and special restrictions. True party of interest violation. Failure to furnish required documents. Violations of a board-approved operating plan. Failing to gain board approval for changes in existing ownership. Failure to maintain required insurance. WAC 314-55-535 Group 4 marijuana producer violations. Group 4 violations are violations involving the manufacture, supply, and/or distribution of marijuana by marijuana producer licensees and prohibited practices between a marijuana producer licensee and a marijuana retailer licensee. Unauthorized sale to a retail licensee. Failure to utilize and/or maintain traceability. Packaging and/or labeling violations (producer). Unauthorized product/unapproved storage or delivery. Failure for a producer to meet marijuana waste disposal requirements. Failure to maintain standardized scale requirements (producer). WAC 314-55-540 Information about marijuana license suspensions. (1) On the date a marijuana license suspension goes into effect, a liquor control officer will post a suspension notice in a conspicuous place on or about the licensed premises. This notice will state that the license has been suspended by order of the liquor control board due to a violation of a board law or rule. (d) May not advertise by any means that the licensed premises is closed for any reason other than as stated in the liquor control board's suspension notice. (a) A marijuana retailer or marijuana processor licensee may not operate his/her business during the dates and times of suspension. (b) There is no sale, delivery, service, destruction, removal, or receipt of marijuana during a license suspension. (c) A producer of marijuana may do whatever is necessary as a part of the producing process to keep current stock that is on hand at the time of the suspension from spoiling or becoming unsalable during a suspension, provided it does not include processing the product. The producer may not receive any agricultural products used in the production of marijuana during the period of suspension.